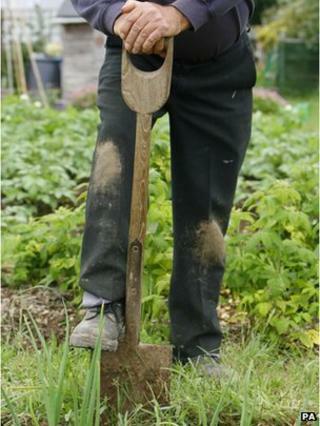 Image caption Is getting the spade out good for the heart? Older people can struggle to exercise vigorously, but the study said simply getting off the sofa and avoiding a sedentary lifestyle was a lifesaver. The Swedish study of 4,232 people suggested the risks of heart attack and stroke were cut. The researchers at the Karolinska University Hospital in Stockholm, said elderly people tended to spend more time being sedentary and less time exercising than people in other age groups. So they looked at the activity levels in-between sitting down and full-on exercise - such as fixing up the car, home repairs, cutting the lawn, blackberry picking or going hunting. The results showed that people who were more active on a daily basis had the lowest risk of a heart attack, but those who were merely active without exercising still had a lower risk than those doing nothing. Being active reduced the risk of a heart attack or stroke by 27%, and death from any cause by 30%, during the 12-year study. The report said: "A generally active daily life had important beneficial associations with cardiovascular health and longevity in older adults, which seemed to be regardless of regular exercise." It said the findings had "high clinical relevance" for older people, who risked spending a lot of time on the sofa or lying in bed. The scientists involved suggest that sitting for long periods of time may lower people's metabolic rate, or a lack of activity may alter hormones produced in muscle tissue. These could then have knock-on effects for overall health. Dr Tim Chico, honorary consultant cardiologist at Sheffield Teaching Hospitals, said: "Although this study only examined people aged 60, it is reasonable to assume that the more active someone is throughout their life, the lower their risk of cardiovascular disease. "The message I take from this study is simple. If you want to reduce your risk of heart disease, be more active. Don't sit down for long periods; get up on your feet and do something you enjoy that involves moving around." Christopher Allen, Senior Cardiac Nurse at the British Heart Foundation, said: "Being physically active is important in maintaining good heart health. But, as this study demonstrates, you don't need a gym membership to do that. "As long as they make you feel warmer, breathe harder and make your heart beat faster, activities such as DIY and gardening count towards the 150 minutes of moderate-intensity [weekly] activity recommended for a healthy lifestyle."